Thursday January 25th 2007. Remember that day. That was the first day blind and visually impaired students summitted the Eiger. Or was it the Matterhorn? Maybe it was Mt. Blanc, or K2; I guess I can’t quite remember because they might have climbed all of them. This all happened within the safe confines of The Rogue Rock Gym, an indoor climbing facility located in Medford, OR. Twenty three blind and visually impaired students from Southern Oregon came together to learn how to climb. Under the expert and patient guidance of the staff at Rogue Rock Gym, the students were introduced to rope knots, harnesses and special climbing shoes that stick to the wall so well that no one is impressed with Spiderman anymore. They also learned the special phrases and terminology necessary to be a climber. 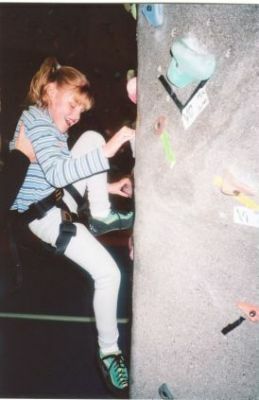 “On belay” became the phrase of the day, and was heard throughout the gym. 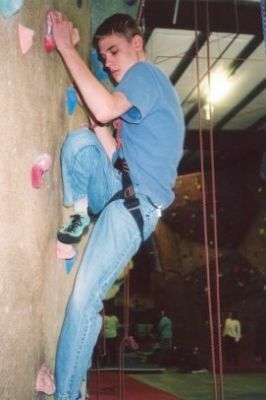 Not only did the gym have many climbing routes of various pitches, or levels of difficulty, but they also have bouldering, in which the students could free climb without needing a safety harness. A tightrope was connected from a wall to a boulder, and many tried their hand at maintaining their balance and walking the tightrope. Luckily the drop was only 1 foot, and so those who plummeted that terrible distance were able to pick themselves up immediately and try again. Most who came on the rock wall climbing field trip conquered their initial fears of scaling a vertical wall, trusting nothing more than a rope and somebody acting as a “belayer” (which is a nautical term used in climbing to refer to the person that is controlling the ropes so that the climber does not fall). There were some who never quite got over their fear and didn’t make it past two or three steps up before requesting to come down. Needless to say, that wasn’t the point at all; all who even tried were successful in that they took that courageous first step of even grabbing the lowest handhold and yelling “on belay!” Others scaled the walls and “topped out”, or reached the top and completed many climbs. The field trip to the Rogue Rock gym was successful on many levels. Old friends reacquainted, new friends came together and all who were there had a great time! Many thanks to the staff at the Rogue Rock Gym for making it all happen.